The Tactical Innovations M22/50 Muzzle Brake is precision machined from heat treated 7075 aircraft aluminum not 6061) and mil-spec type 2 hard anodized for maximum lightweight strength and durability. It completely eliminates any flash and directs muzzle gasses away from the shooter and at angles away from the target. 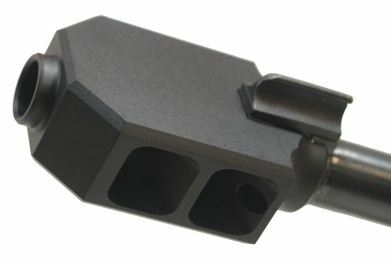 The M22/50 Muzzle Brake is easily installed on factory taper, it will not fit bull / .920 / Heavy / Target barrels) Ruger 10/22 rifles in less than a minute without the need for any special adapter, coupling or barrel threading by utilizing a pair of locking set screws, with one on each side of the muzzle brake hidden inside the porting. The required installation Allen wrench is included with the muzzle brake.